In today’s world, it is easy to focus on what is going wrong instead of what is good and going right. Small acts of kindness are really the big things that change our outlook and ultimately change the way we live in the world. 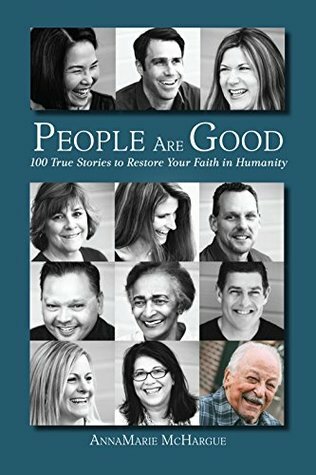 People Are Good is a collection of stories that unites us all. This global movement is sure to restore your faith in the human spirit and remind us that little things are a big deal. • Demonstrates the POWER OF HUMAN EMPATHY and the wonderful impact it can have on others. • Creates an understanding that small moments in people’s lives CHANGE THE COURSE of their existence. The news media and blogosphere flourish with examples of the human capacity for power and poverty, life and death, success and sadness. The mission of People Are Good is to inspire each of us to want to take small moments in life to act, rather than react. It’s more than random acts of kindness but a lifestyle of noticing others, sharing a smile and ultimately changing someone’s worldview for the rest of their life. AnnaMarie McHargue’s passion for beautiful words is something she loves to share with the reading public. She and her sister, Anita Stephens, co-founded their company, Words with Sisters, with the mission of partnering with authors who wish to offer positive messages and inspiration through their work. For Anna and Anita, their grandfather is the embodiment of spreading good while touching the lives of people every day. Wanting to capture this incredible passion for people and life, the sisters compiled stories for People Are Good with the hope of spreading the warmth and joy their grandfather offered so freely throughout his life. This book is a great collection of 100 stories that are "feel good" short stories. It reminds me of something similar to Chicken Soup books where there are different folks who write in and tell an inspirational story. Each of these stories are great and some will move you to tears. One of my favorite stories was of a woman who writes about her father and how she was homesick and needed reassurance of her father's love. It was just a great story and it reminded me that at times we all are looking for our heavenly Fathers reassurance. This book is about stories of people helping others, doing acts of kindness, faith in Christ and making the world a better place. It will lift your faith and inspire you. Thank you to Wynn Wynn Media. A favorable review was not required.